When you need products that work for all your technical tasks, contact CONTA-CLIP. 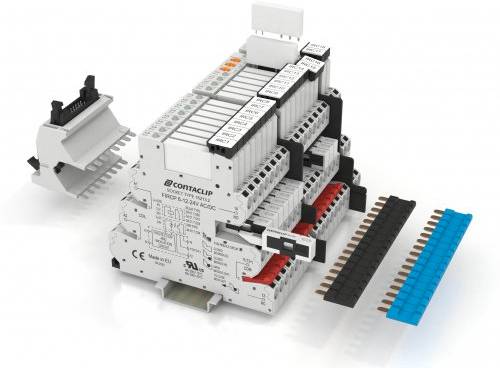 When you purchase CCI terminal blocks, you’ll be provided with a full range of design options like feed-through terminals, component terminals, and double-level terminals. The PRK terminal blocks with Push-In wire connections have distinct advantages over other existing terminal block systems. Our solution permits solid and stranded wires to be inserted using minimal force and no tools. The Push-In spring ensures high contact force. The wire can be removed using the built-in insulated pusher; this mechanism ensures that the terminal point is safely actuated and wire released or inserted without touching the electrical portion. This results in significant time saved during the wiring operation. The extremely compact terminals ensure high current carrying capacity and available in six different cross-section ranges from 1.5 mm² to 16 mm², with 2-, 3- and 4-wire variants for connecting wire cross-sections from 0.34 mm² to 25 mm². Cable Management systems for passing wire and cable through your panel. The KDSClick system features a modular design, consisting of only three types of basic components: frames, inlays and sealing sleeves. Unlike conventional systems where the frame must be opened to insert the sealing sleeve and then screwed shut, CONTA-CLIP uses a dimensionally stable solution with a one-piece lightweight frame and gasket combination made from fiber-glass reinforced plastic. These cable frames allow tool-free assembly and IP66-sealed feed-through of unassembled and assembled cables and hoses. The feed-through openings can also be customized to meet unique requirements. The SAB shied-connection clips can be used to provide a reliable shield contact with conductor diameters from 3 mm to 35 mm. The KDS screw frames are available in 4 different sizes. The inlays make a wide variety of combinations possible. CONTA-ELECTRONICS includes products that are necessary for modern machinery and production to operate and work effectively. This includes timing modules, monitoring modules, signal conditioning components, power supplies and more. Connectors and PCB terminals can be used to design circuit board connections in the most efficient and user-friendly way possible. Additionally, terminals allow for connectivity solutions that are safe and are the most economical solution to your needs. Read below for an outline of products that are offered and contact CONTA-CLIP today if you would like to request a document or schedule a consultation. CONTA-CLIP will provide you with reliable products in wire termination technology. Their products comply with safety standards, are available worldwide, and fulfill your own expectations. Providing products in the connection technology field (CONTA-CONNECT), electronics (CONTA-ELECTRONICS) and PCB connectors (CONTA-CON), CONTA-CLIP has a full range of supplies that have passed the test of time. CONTA-CLIP is big enough to have a major impact on an international level but small enough to provide you with specialized consultation and information to align with your needs.